This 45 is limited to 250 copies worldwide. Hip hop veteran John Robinson (aka Lil Sci) and PVD have been rocking crowd together for over three years at such venues as the Blue Note, NJPAC and Southpaw. 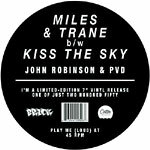 PVD's jazz influenced breaks and John Robinson's intelligent wordplay have been quickly gaining the respect of audiences young and old. The slick, up-tempo ''Miles & Trane'' does more than play homage to the jazz greats. ''Kiss the Sky'' sees JR speaking on what's imporant, backed by the lovely vocals of Melinda Camille.